The current Local Plan for South Northamptonshire was adopted by South Northamptonshire Council in 1997. The Council is preparing a replacement plan for the period up to 2029 which will establish a Rural Settlement Hierarchy for settlements within the District; consider amendments to the existing town and village confines; identify areas of important green space within the settlements and address local development needs. This replacement Local Plan has now reached the stage of “Options Consultation”. Documents have been published which set out the options for determining the scale of development, settlement heirarchy and local green space that, once agreed, will influence the scale and location of growth in particular parishes. The Council is inviting responses to these documents which must be received before 12 noon on 10th June 2016. Details of the documents, with particular reference to Sulgrave Parish, can be seen on the following pages. Printed copies can be seen in the main libraries across the District. 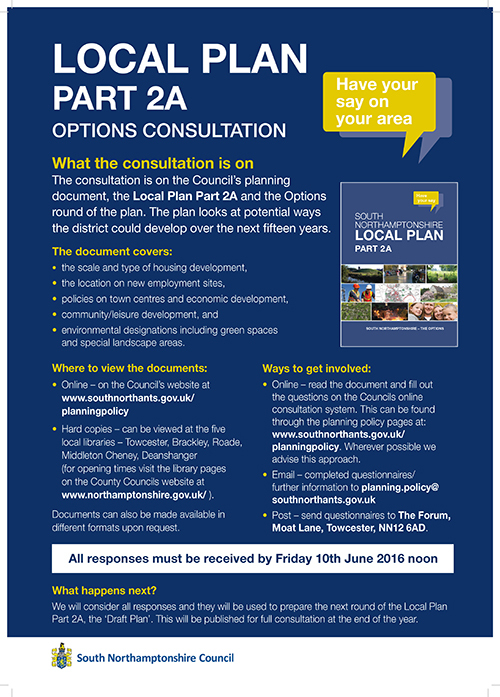 Click here to access the South Northamptonshire Local Plan (Part 2a) Options Consultation Document and Questions. It will be seen that this document sets out the Council’s general vision for the future of the district, followed by the overall objectives and then the methods under consideration for the establishment of a settlement hierarchy. This will involve the categorisation of villages according to the additional development which will be considered appropriate in each case. Responses are invited on each of these topics, which can either be made online by registering as a respondent, or in writing by printing off the relevant pages or visiting a local library. The document then moves on to discuss the scale of housing provision which should be made across the District. The West Northamptonshire Joint Core Strategy Local Plan (Part 1) which was adopted in 2014, sets out the long-term vision and objectives for the whole of the area covered by Daventry District, Northampton Borough and South Northamptonshire Councils for the plan period up to 2029, including strategic policies for steering and shaping development. It identifies specific locations for strategic new housing and employment and changes to transport infrastructure and other supporting community facilities, as well as defining areas where development will be limited. Within the South Northamptonshire Rural Areas, 2,322 dwellings have already been completed or have planning permission since the start of the plan period. Thus it can be seen that the Council has effectively met the rural areas’ housing requirement. Therefore one option open to the Council is not to allocate any additional sites for housing in the rural areas. A significant proportion of the completed and committed development in the rural areas is in the 16 villages that were identified in the Interim Rural Housing Policy (2009). The Council acknowledges, however, that it is important that the remaining villages in the District do not become fossilised and that, in accordance with national planning policy all communities will be expected to meet objectively assessed local housing needs for both market and specifically for affordable housing.The scale and location of any potential further development will however depend on the outcome of this consultation and supporting evidence. However, it will be important that the overall scale of development allowed for in the rural areas is not so significant to have an impact on the wider landscape setting and heritage assets and does not compromise the overall development strategy of the adopted Joint Core Strategy. Paragraph 6.10 of the document sets out the number of dwellings for which provision should be made in each parish, in accordance with a number of different options. It will be seen that the number of dwellings for the plan period up to 2029 in Sulgrave Parish could be in the range 11 to 14. Paragraph 13.1 and 13.2 deal with the subject of “village confines”. 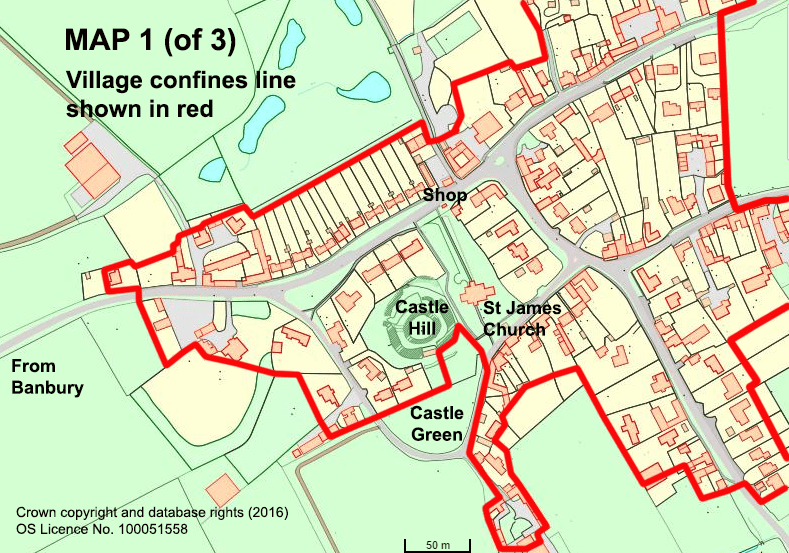 In the current Local Plan, each village has a “confines line” drawn around it, outside which applications for housing development are generally refused. Once the responses to the Options Consultation stage of the plan review are completed, the Council will be considering how the housing allocation to each village can be accommodated, possibly by assuming a certain amount of further development on infill sites and/or the allocation of a site outside the present confines line. In considering this matter, the Council will have regard to existing village character, listed buildings, conservation areas and important open spaces. 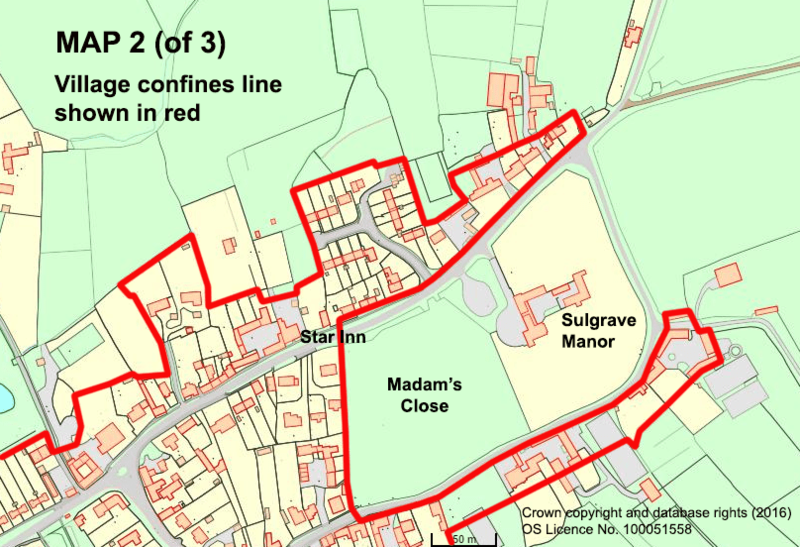 Click here to see specific information relating to Sulgrave Parish which will be used in this process, including statistics regarding population and housing and a map showing the geographical and policy constraints for the village. It will be seen that this map shows, among other things, listed buildings, scheduled ancient monuments, important open spaces and the current village confines line. The line is somewhat difficult to discern on the published map and the following three maps have been prepared to show it in more detail. The third of these detailed maps shows two sites which were put forward for consideration for housing development at an earlier stage of the planning process, one of which is already the subject of a planning consent. Should the confines line for Sulgrave stay much as it is, with further development restricted to suitable infill plots or should there be a relaxation of the line to allow the inclusion of appropriate sites for, perhaps, houses for elderly people or first time buyers? If sites outside the present confines line are suggested, the respondent could either indicate where they might be located or perhaps suggest that this should be left to the Council to decide. Paragraph 8.5 of the document states that local communities are to be given the opportunity to identify areas of green space which they consider should be preserved. 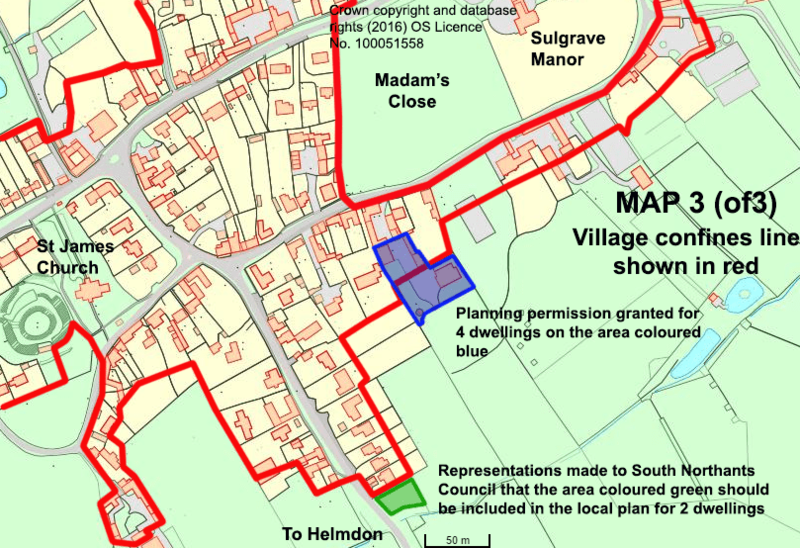 The main green spaces in the village, such as Castle Hill, Castle Green and Madam’s Close and the Stocks are already identified on the constraints map but it may be that villagers will wish to reinforce the general view that these should continue to be protected and perhaps suggest other areas for similar treatment. In this brief summary of a lengthy and complex document I have attempted to draw out those matters of particular relevance to Sulgrave village residents. This should not prevent everyone from making a careful consideration of all the issues and options set out in the Local Plan documents and taking the opportunity to comment upon those which are found to be of particular concern or interest. Comments made by villagers on the future of the village at this “options” stage of the plan making process will make it easier to endorse or object, as the case may be, to the more specific proposals that will be contained in the draft plan at the next stage. Remember to submit your comments, either online or by visiting a local library, before 12 noon on 10th June 2016. This entry was posted on Friday, April 29th, 2016 at 7:35 pm	and is filed under News. You can follow any responses to this entry through the RSS 2.0 feed. You can leave a response, or trackback from your own site.